I was recently asked about my Prius Screen design. I figured it would be worth while going through the design detail here in my blog. My design criteria is to have screens but don't make them real obvious. They needed to be easily stored. They needed to be installed from the inside, and they needed to be something I can easily put up and take down. I also had to be able to get in and out of the car without having to fuss with the screen. After a lot of looking and pondering designs I decided to use thin-walled fluted plastic sheets. Some refer to it as corrugated plastic. This is the material a lot of stick in the ground signs use. 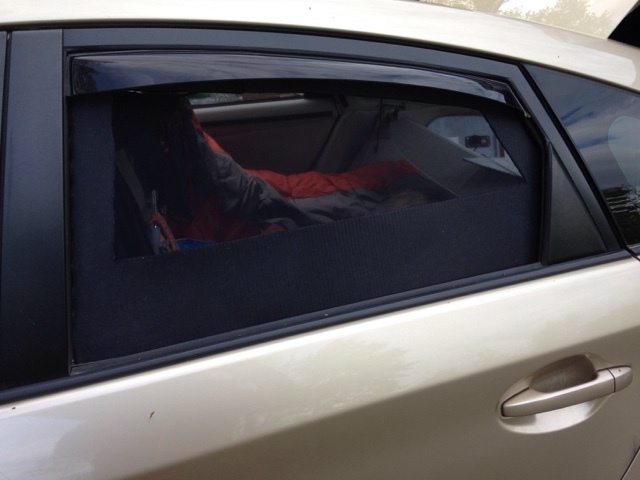 I decided on making two screens, both for the rear windows so I get cross ventilation in the sleeping area. I first cut cardboard to make a template of the window opening. I then transferred the shape to the plastic sheet. It only takes one pattern as either side is a mirror image of the other. Then I decided the size of the opening in the plastic. I cut the opening in the center of the window. This gave me a frame for my screen and an insert I could pop back in. 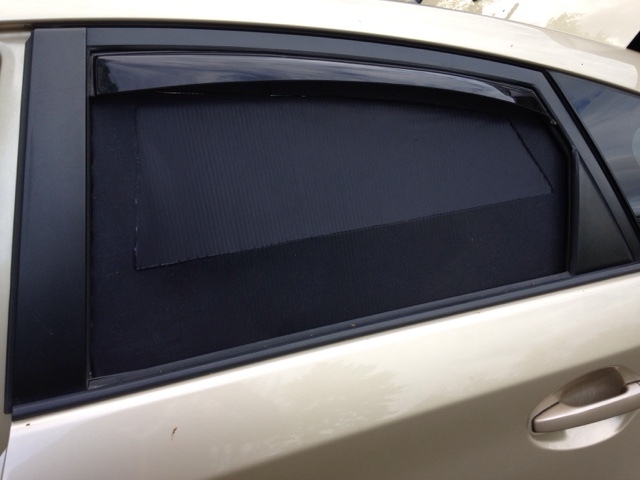 I painted the outside of the plastic sheet with cutout in so the outside would be black to match the tinted windows. I sprayed adhesive to the outside of the sheet on top of black paint. But only the outside and not the center I cut out. I applied no see um screen I bought on Amazon and stretched the screen to glue screen on tight. I added an extra layer of plastic to the top inside edge that is narrow as it needed support. Insert unit into window frame opening. This picture shows the screen with center insert in. Open window and remove center panel and this is what it looks like without my curtains in place. I can leave the window cracked and the vent shade allows air flow but no bugs. From the inside see first picture of this blog. Thank you for the suggestion on using a different color. I was unaware it was available in black at Home Depot . The store near me only had white and I didn't think to check online. I have learned so much from your blog, I'm happy to make even a small contribution. My local Home Depot only had white, but the one about seven miles away had black. Online is bad because their shipping is so high. Could you talk a bit about how you made the cardboard template? Any tips would be greatly appreciated. Making the template is all about scribing. You can find details on doing it on the internet. I learned it from woodworking. 7. Install the cardboard as it should fit at the top and the sides but overlap the bottom. 9. Draw a line on the cardboard and this is your bottom cut line. Use cardboard as practice and once cardboard is right then lay the cardboard on the sheet of plastic and mark the sheet for size and cut. The creation process worked pretty smoothly. I got black Twinwall sheets from Home Depot and then used a silver-ink Sharpie pen to draw the outline. I took a short cut from your instructions and had a friend hold the Twinwall right up to the window opening while I just drew the cut-line directly. The cutouts fit like a glove in the window frame. 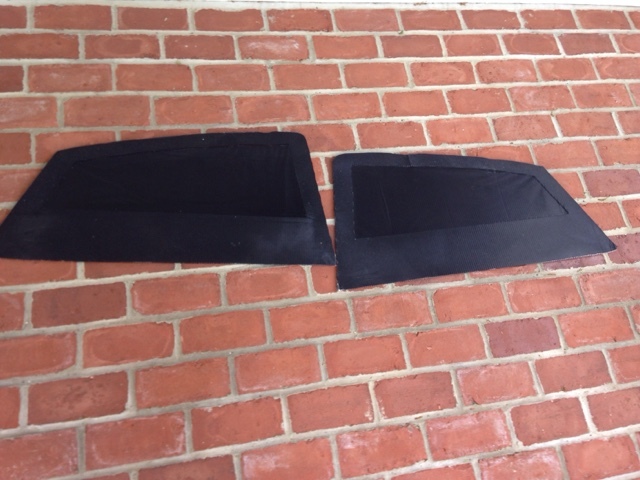 Since an exact fit cutout completely seals the window blocking air flow, I then traced/cut a line just above the Weathertech rain gutters, so that I can crack the windows for ventilation, per your recommendation. But still no one walking by can see in given the combination of the rain gutters and the Twinwall. 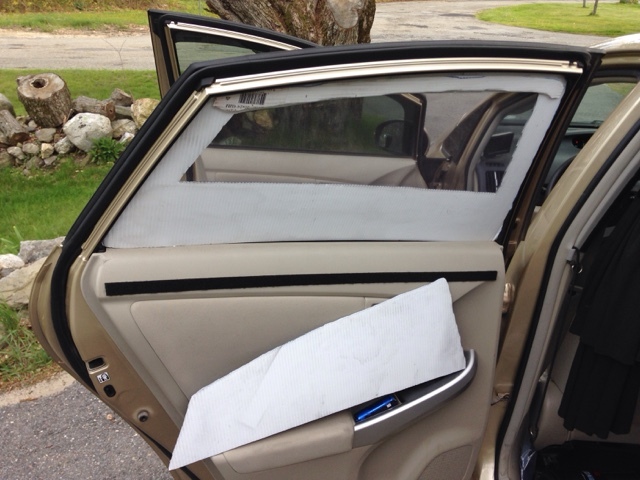 For the large rear hatch window, we taped a bunch of paper together to make one big piece and laid it over the rear window. With the car in a semi-dark garage, my friend got inside the car with a flashlight and shined the light out, which highlighted the shape of the window through the paper so I could trace it. We then cut the paper out and used it as a template on a sheet of Twinwall. One piece of Twinwall is all that is needed and it also fit like a glove. As for the screens, I loved your idea of the NoSeeEm sandwich, but went a different direction on that. My Prius camping is all urban stealth camping, so I need to look as OEM as possible to not draw attention or curiosity. 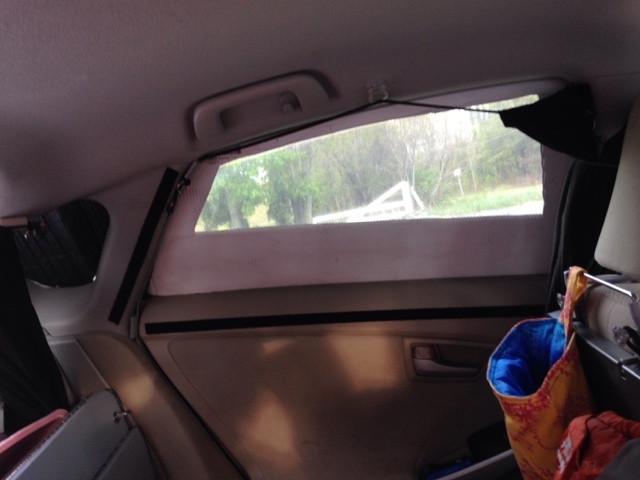 I got screens from Nigel Marston Motorsports (blinds4cars dot com) which are a perfect fit. On really hot nights, I will use those alone and have a full screen window. 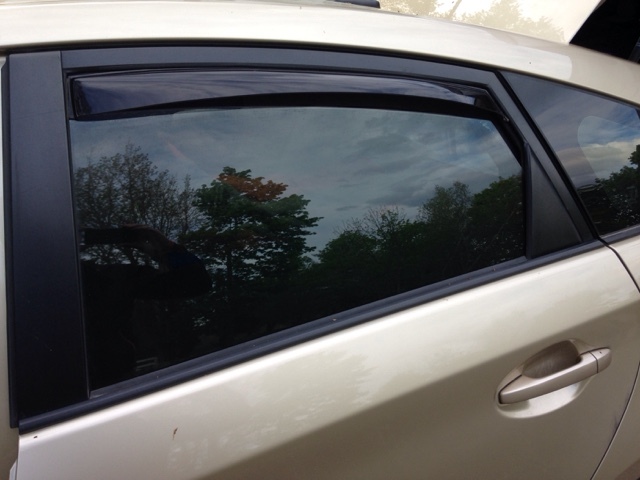 I noticed that after cutting the main rear window piece from the Twinwall, there was enough left-over scrap to create "half windows" for the back. So in combination with the full window screen, I can use the "half window" Twinwall to block off the lower half of the window, so that just the top half is screen. With your blog being a resource for Prius campers, I thought I'd share my experience in the hopes that it will help the next person. Excellent add on to my post and it's great to see others build on one person's ideas to improve on designs. To me it's all about sharing to help others. Keep me posted on any other projects you do as everything can be improved upon.